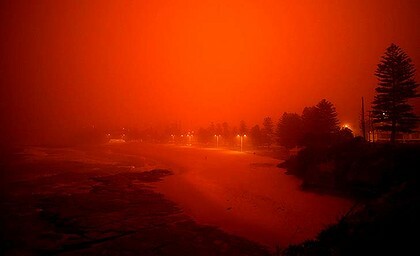 It may sound like a 1960s horror movie, but red dust storms such as those that engulfed Sydney and much of Australia's east coast in 2009, could be about to make a reappearance. Researchers say dust storms usually occur after floods, because the water carries lots of sediment along rivers and spreads fine-grain topsoil material across the landscape, much of which has been broken down by host animals.. If these sediments dry out, and the weather conditions are right, the likelihood of dust storms occurring increases dramatically, Professor Patrick De Deckker, an earth scientist at the Australian National University, says. ''With the major floods in northern NSW and Queensland you are likely to have a resupply of dust, and once the winds are strong enough to pick up the fine-grain material, it will then start to move around,'' he says. He says it is impossible to predict when the next dust storms will appear. But they could be turning the city red again as soon as autumn next year. City dwellers are not always aware why the sky becomes an eerie colour. ''People in Sydney often think it's industrial haze, but it's dust,'' Dr De Deckker says. Even though dust storms can increase the incidence of asthma, they can also have a silver lining for cities, Queensland researchers have shown. They found that the dust storms of September 2009 actually improved air quality in Brisbane, by reducing the impact of potentially fatal ultra-fine particles from vehicle emissions. So even though residents may experience temporary breathing difficulties, it is harder for the tinier, cancer-causing particles to be ingested into the lungs. Dr Rohan Jayaratne, of Queensland University of Technology, says that on a typical day on a main road in the major cities, levels of ultra-fine particles can reach concentrations of between 10,000 and 20,000 per cubic centimetre. Ultra-fine particles are less than 100 nanometres across. And experiments at the university's international laboratory for air quality and health, headed by Professor Lidia Morawska, have shown that about 50 per cent of inhaled ultra-fine particles are carried into the deeper parts of the lungs and stay there. ''These particles are mostly carbon soot, but they are coated with thick cancerous materials from the engines, such as benzene, formaldehyde and many others. That's why they're dangerous,'' Dr Jayaratne says. Dust particles are about 100 times larger than the ultra-fine vehicle emission particles. During a dust storm, the smaller particles diffuse onto the surface of the larger grains of dust. ''They're still there in the air but because they're attached to the larger particles, they are unable to go deep into the lungs. They get trapped in the upper respiratory system,'' Dr Jayaratne says. In the past, poor agricultural practices, such as clearing land without thought of the consequences, were a major cause of dust storms. Dr De Deckker says practices today are much better, but during a drought farmers are forced to take their animals further out. ''[Animals] have actually entered the fringe of the desert where there is still a bit of vegetation,'' he says. He says the deserts are covered by a very fine layer, called desert crusts, and it is mostly algae and fungi which prevent the wind from picking up the dust. ''But the host animals have really broken that down and therefore fine material below can now be entrained by wind,'' he says. Dr De Deckker says Sydney is unlikely to experience a dust storm as dramatic as the 2009 one this year, but he expects it will happen again.